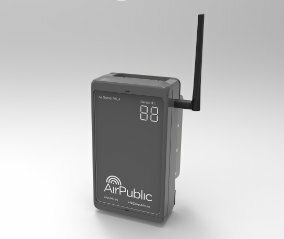 AirPublic provide air pollution monitoring services, particularly focused on NO2 and PM. We installed devices in the playground of Grey Coat Hospital School (GCHS) between 28th August 2018 and 22nd February 2019. The Grey Coat Hospital, founded in 1698, is a Church of England school for girls aged eleven to eighteen which is mixed in the Sixth Form. It is located in the borough of Westminster in London. Air Pollution is a known challenge in London, which has increased in public awareness in recent years. Of particular concern currently are Nitrogen Dioxide (NO2), and Particulate Matter (PM), this study focuses on NO2. In city environments vehicles are one of the the main contributors to NO2 emissions, particularly diesel cars. GCHS is located between four roads. While the two streets on the West and South side are quiet, Horseferry Road, bordering the North and East side carries high volumes of motor traffic, especially taxis. A bus stop is located at the NW corner. Victoria Street, a main arterial road, is 100m away. The school is also close to a fixed reference monitor operated by King’s College London (KCL) as part of the London Air Quality Network. The arrow here indicates the location of the AirPublic sensors in relation to the KCL sensor (ochre hut), when mounted in the school playground. AirPublic monitoring units were installed at the school during a period of 22 weeks, between August 29th 2018 and 22nd February 2019. The units took a measurement of Nitrogen Dioxide every two minutes, and the readings have been collated into hourly averages. The units were also co-located with the reference monitor to calibrate the readings. The results shown below are averages between multiple sensors over a period of 22 weeks. The AirPublic units were placed on the edge of the playground on the side adjacent to Horseferry Road. The measurements produced (right column) show higher readings than those recorded by the nearby reference monitor (left column). In previous colocation experiments the units have shown themselves to correlate to reference monitors with an Rsqr of 0.7. The readings show exceedances of the annual legal limit of 40 µg/m³, although not exceedances of the hourly limit of 200 µg/m³. If these averages were to hold for a yearly period this area would be in breach of current legislation. The exceedances are noted between the hours of 6.00am to 10.00am, and 5.00pm to 9.00pm, with the morning period giving the highest average measurements. During the weekdays the lowest average measurements were between 12.00 and 3.00pm. Planting across the whole of the external fencing could be considered to lessen the spread of airborne pollutants into the playground area from the road. Planting should preferentially be species which have lots of leaves which have small hairs on them such as Ivy. (An example supplier is Plantman). This will mainly support reduction in particulate matter. The location of the bus stop is not appropriate, right next to the playground area. We recommend asking Transport for London to consider moving the bus stop to a different location. Finally, the school can continue to build on any work carried out in travel planning, encouraging parents to car share, or walk or cycle to school and therefore reduce their own contribution to the problem. Walk to School week can be a good way to spark this off, and other initiatives such as Walk once a Week, Bike to School Week or Walking Buses could also be considered.